A branch of blossoms heralds spring’s return in seaside Split – Croatia’s second largest city. In the background is the city’s famous Sveti Duje /Saint Dominus Cathedral. Yesterday, we spent a delightful day exploring Split (more posts to come soon), which is home to Emperor Diocletian’s incredible palace complex, which was built in the 4th century as his retirement home. 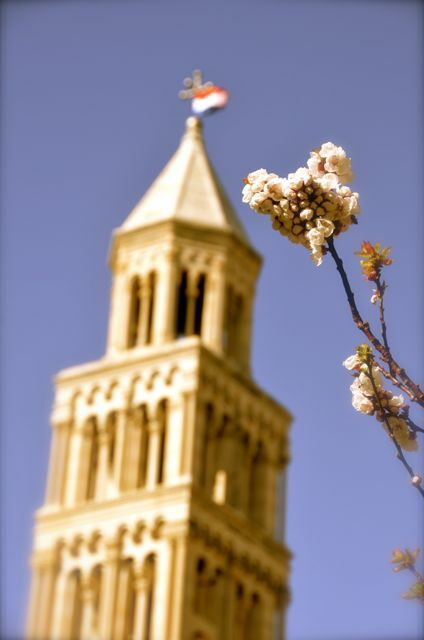 The main part of Saint Duje’s is Diocletian’s mausoleum, which was built in the 3rd century; this bell tower was constructed in the 12th century. Oh…I was there in August. Climbed the bell tower…the view was worth it! I didn’t find it to be scary – but then, I climb so many towers to get the amazing views – this one really fits in to the good climb territory. Looking forward to more of your pictures. Bet spring in Split is stunning! Anita, were the stairs in Split’s tower metal and completely open, looking down? That’s what got me in Trogir (how the metal part of the staircase went right over the open cavern). If it had been stone or wood, I think I would have tackled it. I’ve done a lot of tower climbs too, but this one in Trogir was scary, as per Andrew’s description. Such a pretty shot, Tricia. I can tell you’re really enjoying Croatia. What’s it like for cost of living? Jo, interesting that you ask, because we just recently did our review. We’ve found the grocery store prices (and fresh market) higher than those in Germany (at least in Bavaria). Some chicken breasts, for example, seem to hover around $10 USD, whereas in Germany they were $4-5 USD. Products at our local supermarket don’t seem to be consistently available either, and we get the sense that people hoard the groceries when there’s a weekly sale. Now, we’ve heard that some of the grocery stores about 3 km. from here are cheaper, but since we don’t have a car, we just walk to the closest, largest store. In Germany, our average monthly grocery bill was $350 USD (230 pounds), whereas here, it’s about $450 (300 pounds), and we’re not getting the same quality of meals. We’ve been largely self-catering in our studio apartment, but restaurants in Trogir seem to be comparable, perhaps a bit less, than western Europe. Definitely, it’s possible to work out better accommodation deals if you’re willing to stay longer and if you’re here in the off season! Thanks for the comprehensive reply, Tricia. At the moment it’s very much wishful thinking, but if I were going anywhere other than Portugal and Poland it would be a strong consideration. I do have the impression that prices have risen with its popularity, but isn’t that always the case. Got to get on the bandwagon first. It looks lovely. We are curious what the prices are like outside of our touristic town, but since it’s mostly only locals now, I can’t imagine that the supermarket prices are that much higher than off-the-beaten-path places? The imported food, is of course, more expensive (e.g. any gluten-free products I buy from Germany). We’re also curious how the prices will be the farther south we go. Another lovely photo Tricia. Your posts have convinced me that Croatia should be on our places to go list! Phil, an impressive site indeed! When we arrived to this main square in the ancient palace, we asked ourselves why it’d taken us 6 weeks to visit there. It’s only a 50-minute bus ride from where we’re staying and we’d love to go back! Looking forward to seeing more of your adventure in Split. Thanks, Mark. More to come on the city of Split soon! Meni je zaista drago što istražujete Hrvatsku i njene ljepote i što guštate !!!!!! !